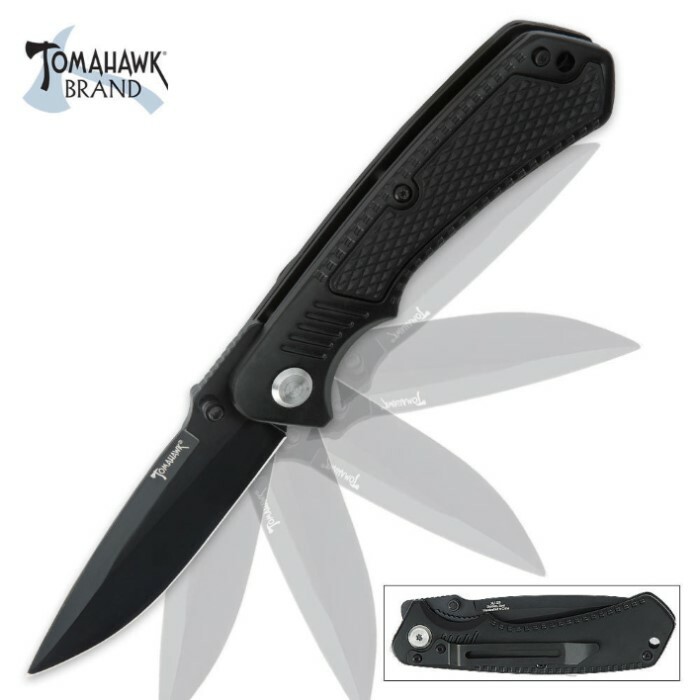 All Black Speed Assist Cyclone Folding Knife | BUDK.com - Knives & Swords At The Lowest Prices! This Cyclone assisted opening pocket knife features a 3 1/2" stainless steel blade with a tough black-oxide coating. The Cyclone assisted opening technology quickly deploys the blade into action once the blade has been initially opened. The black aluminum handle offers a liner lock mechanism and rubber inlays to ensure a firm grip. I bought one of these months ago. I do leather work and make pouches and sheathes. I carry this knife as my everyday carry and use it for everything. I'm very satisfied with it. I liked it so well I ordered a second. that one didn't work so well. The spring is a little weak and it has to be flicked hard to open. I suppose this is the reason for mixed reviews, but for the price I'd say it's an exceptional buy. I may indeed get a third. I assume that some are a bit better than others, but the first I got is great. For the money it's a great knife, nice design, sharp and well built. Rubber grip is only on opposite side from clip which makes sense so it slips into your pocket easily. I had no problem with the spring assist, very positive but the liner lock can be a little tight, oiling and pulling the blade to the open position helps to release the tension on the lock. I prefer a positive lock so it doesn't close on my fingers when pushin point into something. Hey people, I got a great knife for 14.98 with shipping and handling. I love the weight on it and it came so sharp that it cut the hair of my arm with no problem. I just got this knife today in the mail. I love the weight of the knife. It came really sharp and everything is great about it, but its can be hard to close it sometimes. I had hard time closing the knife today and I cut my thumb pretty bad because its kinda hard to close it. I'm really happy with it though. These knives are awesome little work knives. They don't exactly show the very best quality of workmanship or materials but they hold together really well with the addition of some loctite. The pocket clip also catches on things and bends pretty easily. That's where the problems with my knife end. Mine holds a really nice edge when sharpened with a steel. I use it really hard in the woods and have one on my structural firefighting gear. I've used it to pull windshields, pop tires, undo screws, cut seatbelts, and pry with... and it's still holding up really well. For a "disposable work knife" these things are totally awesome. I'd say they hold their own even when compared to $40 kershaw and gerber knives. "This is a solid little knife, but you always get what you paid for, maybe just a little more in this case. I am not sure assisted"" is the best description. ""Encouraged"" opening may be more accurate. The hub/spring mechanism seems to have plastic bushings and is not strong enough to guarantee lock-up without plenty of help. I found I can get enough flicking force to lock it up by using my thumbnail instead of the meat of my thumb on the stud. A decent value -- you would have to pay twice as much to do any better."""